It seems that adding group video chat is the thing right now. Yesterday our portfolio company Kik added group video chat to its popular mobile messenger and Facebook did the same with its Messenger application on the very same day. 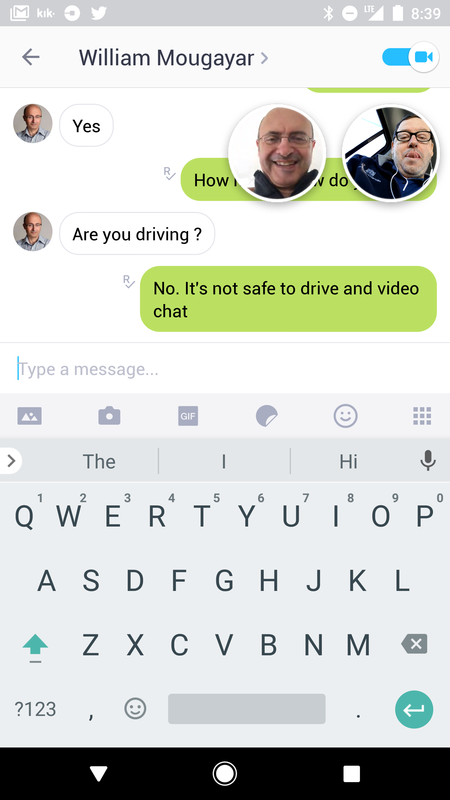 Here’s a screenshot of me and AVC regular William Mougayar video chatting in Kik just now.I was in an Uber (as you can see from my notifications). I believe William was in his home office. 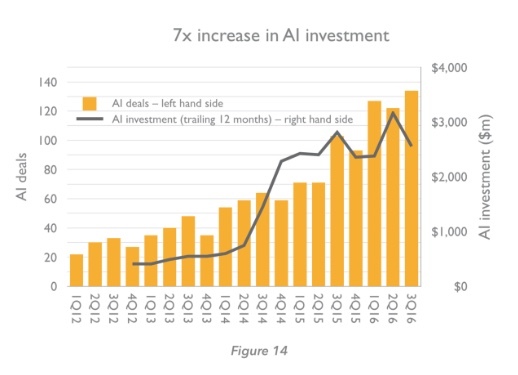 UK-based VC David Kelnar wrote an excellent primer on Artificial Intelligence that is a relatively quick read and helps explain the technology and its advancement over the past sixty years since the term was coined in the mid 1950s. I like this chart which explains the relationship between AI, machine learning, and deep learning. Better algorithms. Research is constantly coming up with better ways to train models and machines. Better GPUs. The same chips that make graphics come alive on your screen are used to train models, and these chips are improving rapidly. More data. The Internet and humanity’s use of it has produced a massive data set to train machines with. Cloud services. Companies, such as our portfolio company Clarifai, are now offering cloud based services to developers which allow them to access artificial intelligence “as a service” instead of having to “roll your own”. 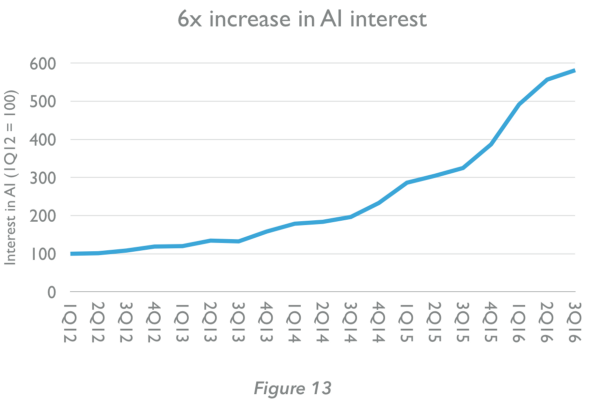 I feel like we are well into the “AI wave” of technology right now (following in order web, social, and mobile) and this is a wave that seemingly benefits the largest tech companies like Google, Facebook, Amazon, Microsoft, IBM, Uber, Tesla which have large datasets and large userbases to deploy this technology with. I would like to thank David for writing such a clear and easy to understand primer on AI. I found it helpful and I am sure many of you will too. Entrepreneurship is not only about making money. It can also be used to create social change. Three time social entrepreneur Nancy Lublin has made a career out of starting non-profits to do exactly that. Last week she sat down with the Gotham Gal and talked about lessons she has learned along the way, most of which apply as much to for profit startups as non-profits. I am curious what the best performing public market asset (stock, bond, REIT, etc) will be in 2017. For the past few weeks I have been going from Board Meeting to Board Meeting reviewing, discussing, debating, and, ideally, approving the 2017 plans for the companies that I work with. 1) Companies should start the annual planning process early. I think September is a good time. It should start with a wide open data gathering process which involves as much of the organization as is possible. 2) The planning process must be grounded in the strategy which should be set in advance of the planning process. If a strategy adjustment is required, that needs to happen before the plan can come together. 3) The senior team needs to do the plan as a group. That can involve offsites, a set of regular (weekly?) meetings, or something else. But planning is a team effort and a plan can’t be handed down from on high like the ten commandments. 4) My number one feedback on annual plans is that they should have less focus areas. I think three big bets is good for most venture backed companies. Five is an absolute max. The more you try to do the less you get done. 5) The numbers should fall out of the strategy and plan, not the other way around. If you don’t have enough money to do everything, change your strategy. Don’t plan by numbers. Plan by developing a set of priorities that come from the long term strategy, and informed by the inputs of the organization. 6) Don’t drop your plan for next year on your Board the day before a year end Board meeting. The good news is that none of the companies I work with did this. I am very happy about that. It is best to give the Board a preview (ideally multiple previews) of the plan as it is coming tother so that you can get feedback and buy-in well in advance of the final approval process. I am a big fan of the annual planning process. I realize that all plans end up evolving during the year and things change and companies adapt. But a good plan gets everyone (including the Board) on the same page, working on the same things, and driving to get to the same place. And that alignment is incredibly valuable. USV recently made two investments in hedge fund managers. You might gather from that fact that we are moving away from venture capital. But that would be an incorrect assumption. What we are doing is finding new ways to invest in technologies that we think are interesting. These would be technologies like artificial intelligence, encryption, and blockchain. Last week it was leaked, and then announced, that USV had led a round of financing for Polychain Capital, a new kind of fund that invests in digital tokens. We have discussed these digital tokens here at AVC and elsewhere. We do plan to directly invest in blockchain based protocols via tokens, but we won’t be able to invest in all of them in a venture capital model, so we are also betting that a fund vehicle focusing on these assets will make a good investment. Yesterday, my partner Andy wrote a blog post on the USV blog about Numerai, a new kind of hedge fund that allows machine learning experts all over the world to crowdsource public market investments by building models and sharing the selections that come out of their models. The data they use to power these models is encrypted and so are their models. It is the “blind leading the blind” according to this piece in Wired. I like that description as the focus moves away from things like fundamental and technical stock analysis to true pattern recognition done by machines. Numerai uses cutting edge encryption technology (a variation on homomorphic encryption), machine learning, and pays out using the bitcoin blockchain. It’s a trifecta of things that are interesting to us, as recognized in this tweet by MIT’s Technology Review. In both cases, USV invested in the “GP” of these funds. In Polychain, we also made a small investment in the fund itself. We did not do that in Numerai, although it is possible that we could choose to do that in the future. Our investments are largely in the companies that manage these funds and they are a bet that these new technologies will offer new ways to build fund management businesses that over time will be highly valuable. These are both startups and we think of these investments as classic early stage investments with all of the risk and return that comes along with them. If you are like many people I know, you are dismayed about the 2016 political cycle, not only the results and how they came about, but with the whole damn thing. Some hackers have decided to do something about that and created the Debug Politics Hackathon. The first Debug Politics Hackathon happened this weekend in the Bay Area. The first NYC Debug Politics Hackathon will happen the weekend of Jan 13-15. You can RSVP to attend here. Debug Politics Hackathon is also coming to LA and will happen the weekend of Feb 3-5. Details are here. If you want a better political process for this country, and really any country, and you want to hack on that desire, then consider attending one of these events. As told in Whiplash, the Lumiere brothers started showing films to audiences in 1895 using their patented cinematograph. But by 1900, they were out of the film business and had moved on to color photography. The industry they helped to start went on to be one of the biggest new industries of the 20th century. I often think of the formative years of the Internet, in the early/mid 90s. There are a lot of people from that era that remind me of the Lumiere brothers. I was in a Board meeting on Friday in my office and one of the executives of the company that was having the Board meeting left to get coffee or use the rest room. When he came back, he said “why do you have one of the Josh Harris Gilligan paintings in your office? I explained that the reason Gilligan hangs in my USV office is to remind me that being first to something doesn’t mean you will profit from it. Josh Harris was the first person to show me audio streaming over the Internet. Josh was the first person to show me video streaming over the Internet. He did both of those things at his Pseudo Programs company that he started in 1993. Around the same time, 1993 ish, Josh predicted to me that auctions would be one of the first big businesses to take shape on the Internet. That was roughly two years before eBay was founded. Josh didn’t profit much from any of his visionary efforts or insights. But there is a Josh Harris painting in my office because I respect being early more than I respect making profits. I think the latter is easier than the former. Which takes me to some things we have been thinking a lot about at USV recently. Things like Blockchain and Genomics. We think we are very early in these two important technological revolutions. We are investing actively (but not heavily) in one of them (blockchain) and trying to find the right entry point to the other one. I think that the investing we are doing in these sectors right now is more likely to be like Psuedo Programs than YouTube or SoundCloud. But I also think that you have to be early to learn the technology and the markets and build the networks and relationships that will allow you to see, understand, and invest in YouTube when it shows up. What you don’t want to do is lose patience or interest and move on, like the Lumiere brothers did. Early stage VC is a marathon, not a sprint. That is true in everything, from the hold periods, to the work you do with a portfolio company, to the patience you must show towards a sector you think will be important. It is hard to sustain the enthusiasm sometimes, but if you have conviction about something, you have to stay the course.